Mechanical keyboards are a killer upgrade for gamers and people who type all day, and doubly so if you’re still using the cheap plastic plank keyboard that came with your PC. With the right type of switch under the keys, you’ll get better physical responsiveness from your keys, and in some cases an easier time for your fingers and wrists. Today, Amazon has some great deals on mechanical keyboards from Aukey. Our favorite of the bunch is this 87-key backlit keyboard with Outemu Blue switches for $26 with the coupon code MT3MZVCY. That’s a great price for a budget mechanical keyboard, especially if you don’t want to pay the far higher prices for our favorite gaming keyboards of 2018. Even budget mechanical keyboards usually start around $75 or so. The Aukey keyboard features a 6-color backlight with per-row lighting (as opposed to per-key) and nine lighting presets, with two slots for customized presets. The keyboard also has full n-key rollover to make sure each keypress is detected independently, avoiding misinterpretation by the computer, as well as anti-ghosting technology. And this laptop is water-resistant, so drink up coffee spiller nation! The Outemu Blue switches offer the same type of key behavior as Cherry MX Blues, so you’ll get a tactile bump, loud clicks, and the key should actuate when you press about halfway down. Cherry MX Blue connoisseurs will obviously feel a difference between the original and Outemu, but the goals of both switches are generally the same. While it’s always great to get the original switch, sometimes the prices are well worth looking at rival keys. Besides, Aukey’s a good discount brand so you can expect pretty solid quality, though we haven’t reviewed this particular keyboard ourselves. It’s carrying a strong 4.2 out of 5 rating across more than 120 Amazon user reviews. 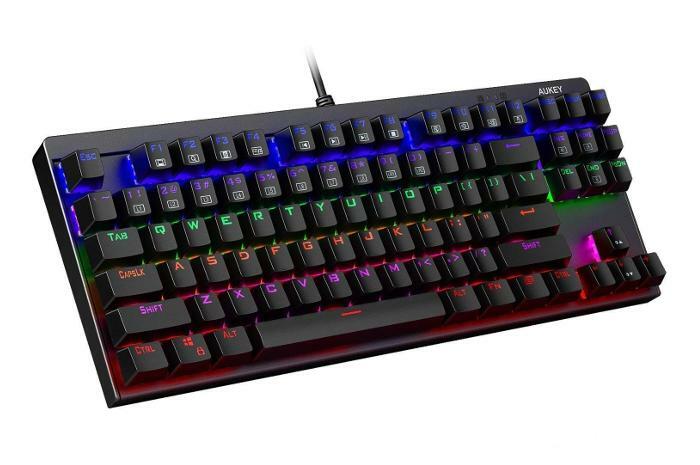 This story, "Upgrade to a water-resistant mechanical keyboard for just $26 today" was originally published by PCWorld.